Christopher Marlowe’s ballad “The Passionate Shepherd to His Love” is probably one of the most well-known poems or, as Mallory Ortberg calls it, “The Most Frequently Owned-Upon Poem In History.” In class we learn about Marlowe’s pastoral love poem but we barely scratch the surface of the complicated and fascinating history surrounding this poem. From directly after its first printing to modern-day, the poem has inspired responses in all genres of literature, art, and music. Its manifestations include a broadside ballad, newspaper comics, jazz songs, poetic parodies and replies, as well as paintings and textile works of art. I have found that there is no one place where this information has been cultivated. The site is designed so that users can have an informative, interactive experience as they journey through the ballad’s many incarnations. The main sections of the site are dedicated to the work as a “poem,” the work as a “broadside ballad” with its many intricacies such as tune and woodcuts, and the long and current history of the many “responses, replies, and parodies” of the work. The last section of the site is dedicated to the project background. 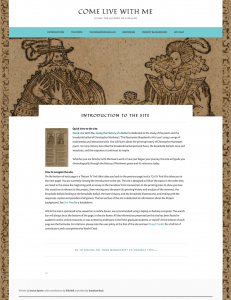 Here users can learn all about my research process in creating the site and about the many people who have contributed, including the English Broadside Ballad Archive (EBBA). The site features interactive timelines, playlists, videos, and recordings of the ballad (the recording of the ballad is sung by Erik Bell, Singing Team Manager for EBBA, and me). Later I will be posting about the entire experience of creating this site along with breakdown of how I handled the footnotes/works cited page, finding free programs to create the multimedia, and organizing the site. I hope this will help anyone else (particularly other undergrads working on their own research site) on a similar research journey. The site will never be “finished” in my mind. Christopher Marlowe’s ballad continues to inspire people, and so I will continue to update this site. Keep checking back and follow the blog to get the latest news! Jessica Grace Sparks is a senior at UCSB graduating with a B.A. in English and Renaissance Studies with an Early Modern specialization. This project was made in collaboration with EBBA and as a part of the Arnhold Undergraduate Research Fellows Program. Also posted on Miscellany: An Early Modern Blog.